On December 2, 1986, a worker at the Hatch nuclear power plant in Georgia mistakenly closed a valve in the air supply line to the inflatable seals around the gate between the spent fuel pool and the transfer canal. These seals are like a bicycle inner tube running around the edge of the gate. After the gates are installed, the seals are inflated with air to provide a leak-tight fit. 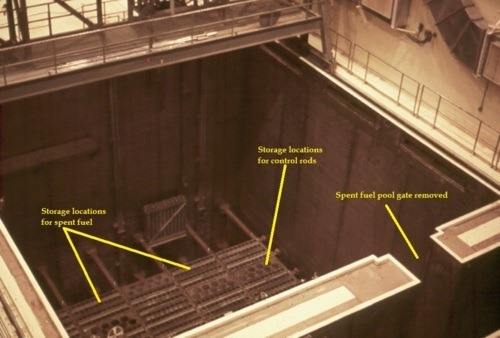 Figure 1 shows a spent fuel pool at a similar nuclear plant with its gate between the pool and the transfer canal removed. Transfer canals are the narrow passages between the reactors and the spent fuel pools. Transfer canals also link the two spent fuel pools themselves via the cask storage pit. Gates can be installed between the spent fuel pool and the cask storage pit to allow the pit to be drained of water. Each gate is a concrete block. Air leakage, with the air supply isolated, caused the seals to slowly deflate. When the seals deflated, water leaked from the spent fuel pool into the empty transfer canal region. By the time the problem was detected the next day, approximately 141,000 gallons of water had been lost from the spent fuel pool, dropping its water level about five feet. The decreasing spent fuel pool level went unnoticed for several hours because its leak detection system was not in service. At the time of this event, there were a number of activated control rods hanging on the spent fuel pool’s walls. These control rods had been removed from the reactor core during a recent refueling outage and were stored in the pool because of their high radiation levels. Portions of the control rods had radiation readings levels of 8,000 to 10,000 rem per hour. The lethal dose is 450 to 600 rem. If the spent fuel pool water at Hatch had dropped as far as it could have with the deflated seals, some of the control rods would have been completely uncovered. The estimated radiation levels at the spent fuel pool railing would have been around 100 rem per hour. After only three minutes, a worker would have received the maximum dose of radiation permitted by federal regulations for an entire year. A worker would have received a fatal dose of radiation in about five hours. It would not have taken any worker five hours to recognize that the control rods were no longer covered by water. Spent fuel pools are underestimated hazards at nuclear power plants. The reactors get all the attention. When workers manipulate valves on reactor systems, a second worker must verify the proper configuration is achieved. Valves on spent fuel pool systems don’t require checking. Instruments monitoring key parameters on reactor systems require backups to ensure the parameters are monitored 24/7. Instruments monitoring key parameters in the spent fuel pools neither require backups nor even to be working themselves. If we continue to treat irradiated fuel in spent fuel pools so cavalierly, we risk someday having lots of dead cavaliers.